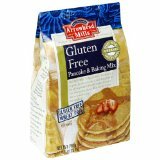 Amazon.com has good everyday prices on Gluten Free products. When those products are on sale, the deals are often too good to pass up. Right now there is a huge sale going on. There are two ways to save: September Coupon Deals & Manager’s Specials. The discount in parenthesis is what you will get if you use Amazon Subscribe & Save program. Subscribe & Safe is a good program because you can cancel at anytime, and Subscribe & Save always ships free, no matter how small the order. Please note that not all of these product lines are 100% gluten free. I have linked to information on the gluten free status of the products offered. That was a highlight of some of the notable gluten free categories on sale in September. However, there are even more gluten free items and other grocery items on sale! Click here for all of the September special savings on Groceries and Gourmet Food with Instant Rebates and Free Shipping. In addition to the September coupon deals, there are several manager’s specials on gluten free product right now. Supplies are limited on most of these items, so act quickly. If you have any questions on how to take advantage of these deals, please feel free to ask in the comments. Living gluten free isn’t cheap, but hopefully with these deals it can be a little bit less of a burden to your pocketbook. One Response to "Gluten Free Grocery Deals Abound at Amazon.com"
Thanks Sarah!! I just ordered the Annies Mac-n-Cheese. It is very good and comes in handy The free shipping makes it a super good deal.